Well, I wasn’t sure if I was going to be home today or not. Turns out, it wasn’t my decision. Some black ice near Bridgman yesterday decided I was going to be in Kalamazoo and not in Chicago. Since I was going to be gone, my Mother-In-Law drove up from Chicago to hang out with J. We had actually been invited to Salt of the Earth for the Food Network taping last night and since I couldn’t go, J and her mom were going to go. I ruined those plans while I was sitting up against the cable guard rails facing the wrong direction on I-94. Since J’s mom was already here, she stayed the night hoping the weather would be better today. J was actually off this morning because she’s attending a class to become certified as a MIFA judge which started just as her shift usually ends. Since we were all here, we decided to get up for breakfast. Yes, I even got out of bed before noon on a day I didn’t have to work. We were planning on going across town to a place in Portage, but it was a little later in the morning than we planned on leaving, so J asked if there was anything close. There’s always something close and surprisingly, there’s a place near us we’ve never been to. 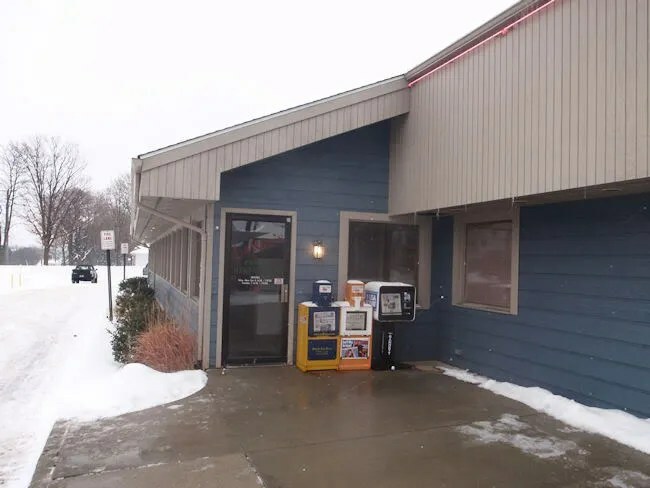 La Rue’s Family Restaurant is on Stadium Drive in Oshtemo Township near Parkview and comes highly recommended. I have no idea why we’ve been in Kalamazoo a year and a half and haven’t been there yet. Since moving to Oshtemo, I’ve been saving it for some rare occasion when we could actually go to breakfast. It was surprisingly busy for a Tuesday morning at 10:30. The parking lot is a little weird and wraps around the building. We entered off Stadium and had to drive around the backside of the building to find an empty spot and we were kind of lucky we found one as close as we did. Once inside, you come to a waiting room that is equipped with a TV. I’m guessing they are pretty packed on weekends which is why this room is large enough for a couple benches. We made our way through the door leading from the waiting room into the restaurant. There was a hostess waiting for us and she showed us to a booth in the dining room to the right of the door. The building looks pretty large from the outside, but inside, they are pretty cramped for space. The aisles aren’t that big and the booth was pretty cramped. The place has the feeling of a home town diner. The waitresses are friendly, everyone seems to know everyone, and there were a few tables where people just came in for coffee and to chit-chat. On their way out, I heard several people say, “See you tomorrow” to the wait staff. Oh, and the big thing that makes me think home town diner, the advertisements. The place mats were paper and were filled with printed ads. Even the coffee mugs had ads printed on to them. My MIL started with coffee, but neither J or I are really coffee drinkers. I really needed a Pepsi and was glad to see they carried Pepsi products. J got a Diet. We were only 15 minutes short of lunch time, but La Rue’s serves breakfast all day and that’s what we all were really in the mood for. I found what I like to see on the second page of the menu. 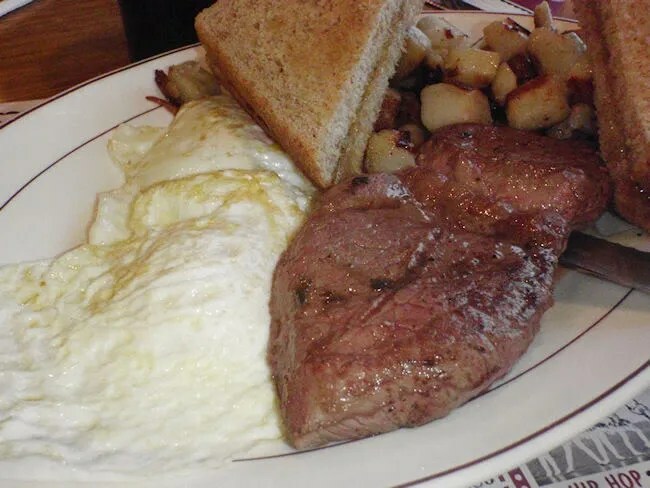 The Steak and 2 Eggs which comes with toast and potatoes. I went with the five ounce version medium rare. The steak is pretty much what I expect for breakfast. It was a little tough, but very tasty. It was pink the middle, but not runny. 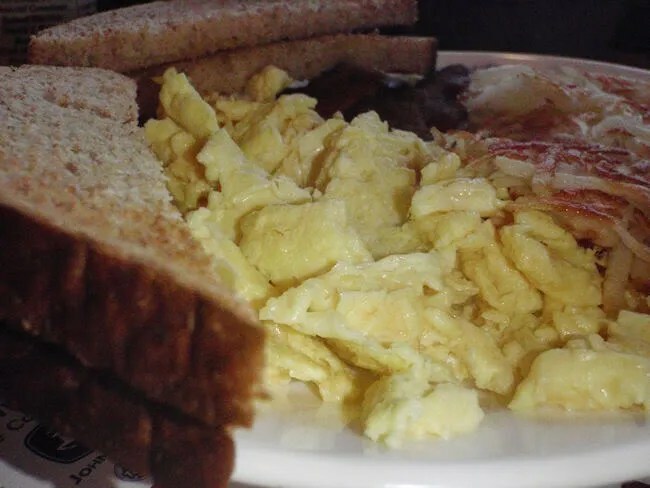 The eggs I got medium and they came out just a little bit runny…just the way I like. I got wheat toast and there were two pieces of bread cut in to triangles. They came pre-buttered so they had the great taste of the butter seeping into the bread. For the potatoes I went with the American fries. I only ate a couple because they were really potato-y tasting. I know, weird right. Potatoes taste like potatoes. Yeah, I’m weird. They had a good, greasy flavor, but not my thing. They weren’t bad…I’m just a picky potato eater. J ordered Two Eggs with Bacon, toast, and potatoes. She got her eggs scrambled but only ate a few bites. She’s kind of like me with potatoes. The eggs were fine, but she likes the other things on her plate more so she filled up on them leaving only a little room for the eggs. The bacon were thick cuts, but very crispy. She pulled off a fatty piece for me and I was a little jealous that I didn’t get any bacon. She also went with wheat toast and her potatoes were hash browns. J can be a picky hash brown eater. She really likes them cooked all the way through and these must of been because she didn’t leave any on her plate. J’s mom was intrigued by the Egg on an English Muffin. It’s like a breakfast sandwich from McDonald’s, but much better. 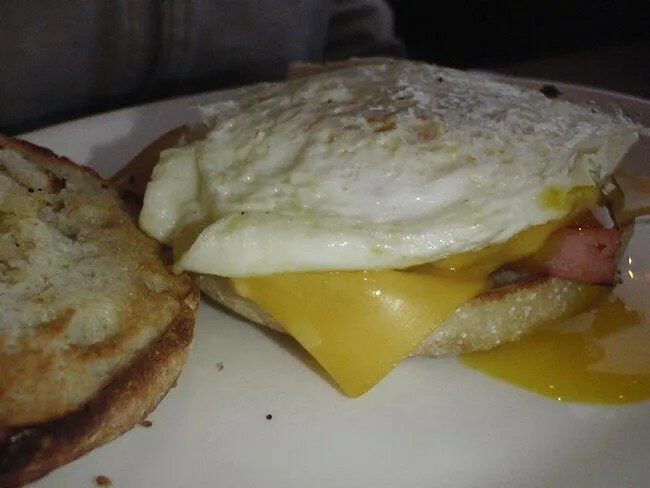 The English muffin is stuffed with an egg, cheese, and bacon. She opted to have the egg a little runny in the middle because that’s the way she likes eggs. She didn’t really make any comment about it, but cleaned her plate, so I take that as a good sign. Our bill was right around $25 with my plate being the most expensive at a little over eight bucks. 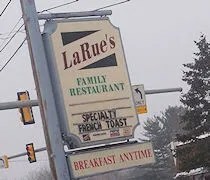 La Rue’s was exactly what we were looking for in breakfast. It was a quick meal and a really good price (less than $10/person.) It’s the perfect greasy spoon, home town diner that every community needs.